Helloooo my friend! It’s the first new recipe post of 2019! And I’m so excited to be bringing it to you. I made a big pot of chili over the holiday break (one of my favorite one-pot winter meals!) and it felt like a great opportunity to perfect my cornbread recipe. I think you are going to LOVE it- it’s so moist and sweet and light and fluffy. As of right now, I don’t have a whole ton of breads or savory recipes on this site. There are a few favorites, like these southern-style buttermilk biscuits, these brioche hamburger buns, and these homemade soft pretzels. But for the most part, my specialty has always been desserts. I’m looking to change that in 2019! Over the next few weeks, get excited because I’m going to be sharing some of my absolute favorite savory comfort foods and game-day snacks. I can’t wait! It all starts with this recipe. 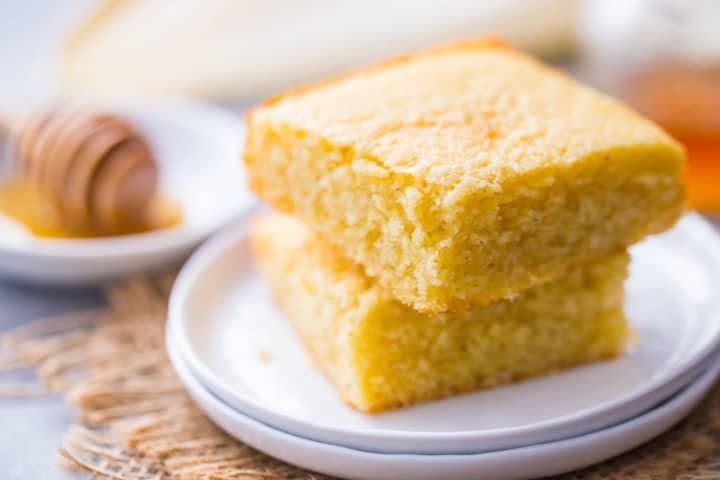 We are big cornbread lovers here at my house, and we especially love when it’s super moist and a little sweet, with a light and fluffy texture and edges that are just a little bit crispy-crunchy. Cornbread is the perfect accompaniment to so many great dishes. My husband loves a square of this for breakfast, lightly toasted and spread with a little butter. And my kids love corn dogs! This batter could definitely be used in that way, or as cornbread waffles. You could also use it to make your favorite cornbread stuffing or dressing! 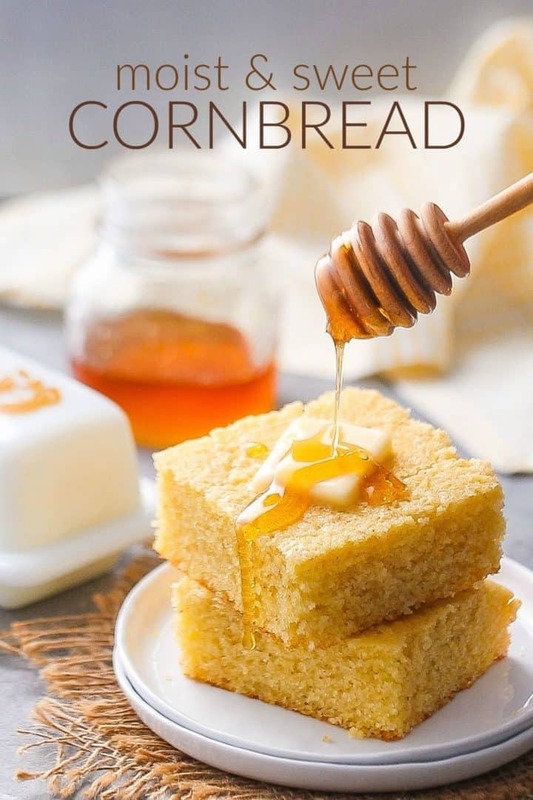 Homemade cornbread is super easy to make from scratch, so if you are a beginning baker, this would be a great recipe to start with. Just whisk the dry ingredients (flour, cornmeal, sugar, baking powder, and salt) together in a big bowl. Then, in a separate bowl, combine the liquid ingredients (melted butter, milk, oil, and eggs). Pour the liquid into the dry and mix together until smooth. Then just pour the batter into the pan and bake! The cornbread will puff up so light and fluffy in the oven, and you’ll see the edges starting to become golden brown and crispy. When a toothpick inserted in the thickest part comes out clean or with a few moist crumbs, it’s done baking! WHAT KIND OF PAN SHOULD THIS BE BAKED IN? You have a lot of options with this recipe! For most of the pics you see here, the cornbread was baked in a 9×13-inch pan and cut into squares. But for the video, I made you a skillet cornbread! This is made in exactly the same way, the only difference was I added about 1 1/2 tablespoons of butter to the cold pan and placed it into the oven as it was preheating. The butter gets melty and a little browned, and the pan gets searing hot, so that when the batter goes in it gets really crispy on the bottom and around the sides. It’s fantastic! You could also bake this recipe in a square pan, or as muffins or mini-muffins. Different sized pans may require different bake times, so keep an eye on things and when it looks fluffy and a little golden around the edges, give it the toothpick test. Most of the time I just like to eat my cornbread plain and simple, but sometimes it’s fun to get creative with add-ins. Toss in a few handfuls of fresh, frozen, or canned corn kernels for an extra-corny version. Crisp up a couple slices of bacon, and crumble them into your batter for a smoky, savory bacon cornbread. Slice a jalapeno pepper or two into thin rounds and swirl them in, for a spicy jalapeno take. Fold in a few handfuls of shredded cheddar cheese for easy, cheesy cornbread. I would not recommend using all cornmeal, because the result will be really crumbly and dry. The combination of flour and cornmeal really produces a nice result with a moist, cake-y texture. HOW LONG WILL CORNBREAD LAST? Keep this tightly covered, or slip it into a zip-top bag, and it should stay fresh for a few days at room temperature. Or, keep it in the fridge for about a week. You can also freeze it! Just take it out a serving or two at a time, and allow it to thaw at room temperature. This cornbread can be reheated for about 15 to 20 seconds in the microwave. Or, wrap it tightly in foil and warm it in the oven on the lowest setting. 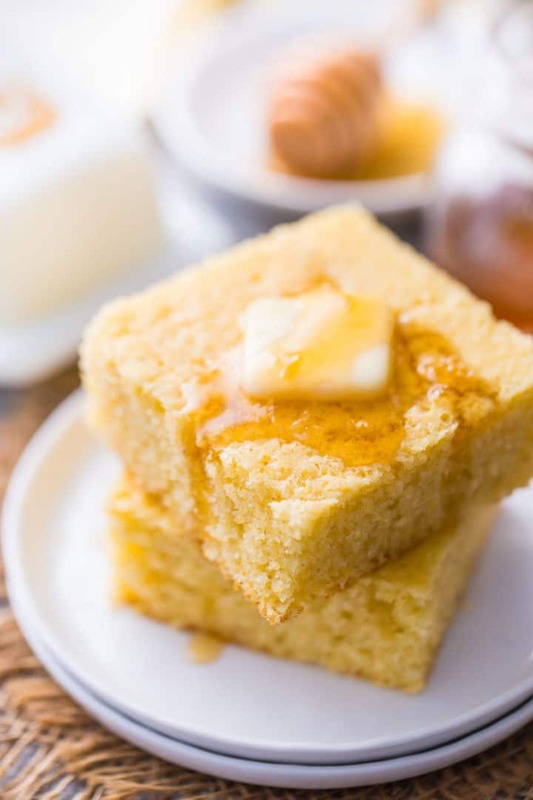 Next time that cornbread craving hits, pull out this easy recipe! It’s the best I’ve ever made and I think you will love it! In a large bowl, whisk the flour, cornmeal, sugar, baking powder, and salt together. Whisk the melted butter, milk, oil, and eggs together in a large liquid measuring cup. Pour the liquid ingredients into the dry and stir together until combined. 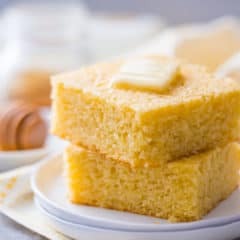 Transfer the batter to the prepared pan, and bake for 35 to 45 minutes, or until fluffy and slightly golden around the edges (a toothpick inserted into the thickest part of the cornbread should come out clean or with a few moist crumbs). Cool for about 20 minutes, then cut into slices and serve. Recipe adapted from A Thrifty Mom. Aw, aren’t you the sweetest! Thank you so much for the kind words Lou. I’m so happy you’re enjoying the recipes. Have a wonderful evening! potatoes, green beans, applesauce & cornbread. Just like my mom & grandmother made. Family favorites. I was just looking at a delicious chili recipe, and this would pair with it perfectly! Corn bread is like what my mother made. We are having it with Beef Stew for supper tonight. Glad you included skillet part of cooking. 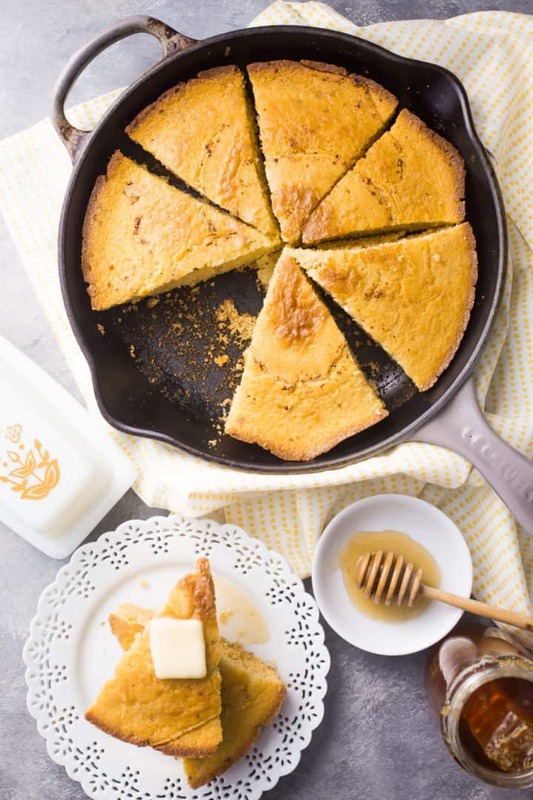 Cast iron skillet is only way to bake corn bread. I loved the skillet version. So crispy on the sides and bottom! Hope you love it- sounds fantastic with beef stew!